Mark McHale’s championship ring was stolen. When Mark McHale looks at the gleaming ring on his finger, he marvels at where it’s been. This isn’t just any ring. It’s a prized trophy from his coaching days at Don Bosco Technical High School, where he helped lead the hockey team to the Division 1 state title nearly 25 years ago. It brings back memories of the big championship game on March 15, 1989, when Don Bosco faced rival powerhouse Catholic Memorial at the Boston Garden. The old Garden was packed to the rafters, and before a crowd of more than 10,800 fans, Don Bosco roared back from a 2-0 deficit to beat the defending champs, 5-2. “It was an unbelievable win,” said McHale. 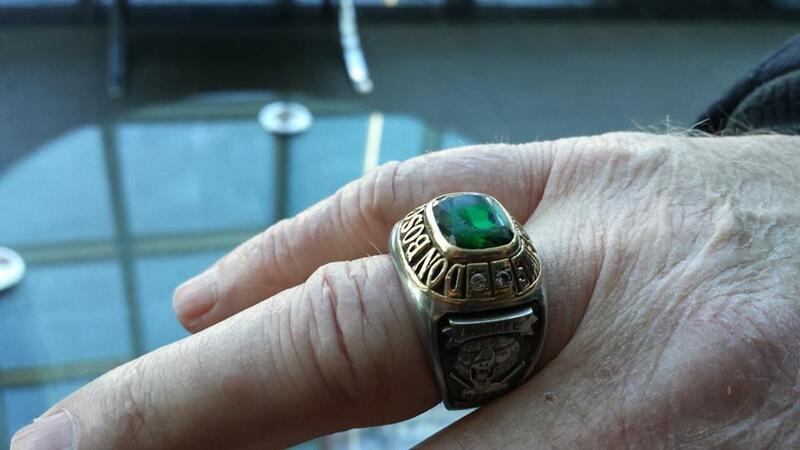 His ring of gold, silver, and emerald green is a priceless keepsake from that indelible season. Then one day in 2008, the unthinkable happened: McHale’s home on Range Road in Dorchester was broken into. Burglars rifled through his things and took whatever they wanted, including his beloved ring, which was engraved with his name, crossed hockey sticks, and Don Bosco’s bear mascot. McHale never expected to see it again. “I thought it was gone for good,” said the 59-year-old, now a Suffolk County probation supervisor. Flash forward almost six years, to Feb. 9, 2014, when Boston police officers at the District B-3 station in Mattapan were booking a man who had been arrested on a probation warrant. As they were processing the man’s belongings, the Don Bosco hockey championship ring gave them pause. The officers took a closer look, and noticed the name “McHale” engraved on the side. Now the McHale family from Dorchester is synonymous with two things: ice hockey and the Boston Police Department. Mark McHale’s daughters work for the Boston Police Department; so did his father; his brother, Gerard, is a retired deputy superintendent; and Gerard’s three children also became Boston police officers. The two officers who spotted the ring thought it might belong to one of their own. They contacted Officer Garvin McHale, who explained his uncle’s house had been broken into some years ago and said it was probably his. 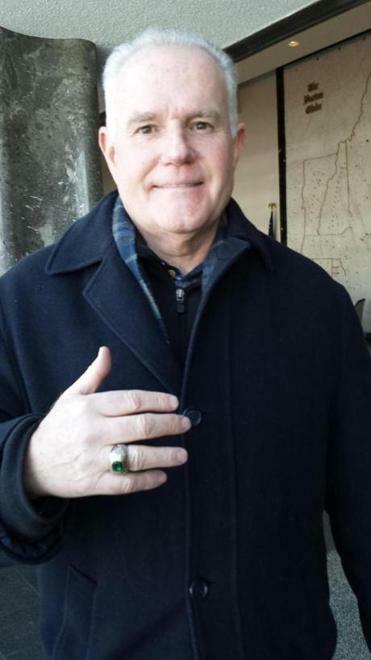 When Mark McHale learned his ring had turned up at the police station on Blue Hill Avenue, he could hardly believe the news. Last week, he went to Station B-3 to claim it. He met the two officers, commending them for their attention to detail. “The Boston police did a great job on it,” he said. McHale said one of the officers turned out to be an alum of Don Bosco, and the other officer’s father had graduated from the Catholic school, which closed in 1998. He slipped on his ring: After six years, it’s back in the right hands. McHale said the ring has brought back a rush of memories, of that long-ago championship season, the huge crowds at the Garden, and that sweet victory over CM, the long-reigning champs. He still lives in Dorchester, and when he’s not working as the regional probation supervisor for Suffolk County, he is often at local ice hockey rinks coaching the Archbishop Williams High School girls’ hockey team. McHale has a lot to look forward to, because his Archbishop Williams squad has qualified to compete in the MIAA state tournament. McHale is hoping for another big win. Perhaps the ring will bring him good luck. He now gets a kick out of telling the story about how the Boston police recovered this precious piece of jewelry after so many years. “It just shows you, that you can’t lose faith,” he said.